An intruiging alternative to the Chromecast for business users who are looking for a Windows-like deskop experience (or content mirroring) on an Android tablet. When it comes to enterprise mobility, the message coming out of Dell's recent Solutions Summit in Brussels was loud and clear: business users still aren't making the most of their tablets. Dell reckons this is partly down to the still widespread perception that tablets are companion devices to laptops and are meant for lightweight, rather than heavy-duty work. The PC maker is hoping to change that with the launch of the Dell Cast, a media streaming device that is set to come to the UK following a stateside launch earlier this month. The hardware shares similarities with Google's Chromecast: both are small enough to easily slip into a pocket, connect using HDMI and and let you beam content being displayed on a mobile device to a larger display. There are, however, a few key differences that set them apart. 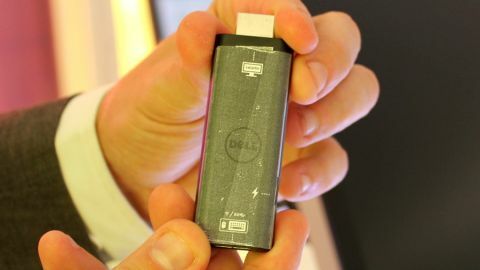 Dell's product is aimed primarily at business users, costs more than twice as much ($80 versus the Chromecast's $34) and is currently more limited in terms of compatible devices. Where the Chromecast supports a wide range of Android and iOS smartphones and tablets, the Dell Cast only works with the company's own Venue 7 and Venue 8 Android tablets, with support for Windows (including the Dell Venue 8 Pro), in addition to its upcoming Venue tablets, arriving later in the year. The Dell Cast takes just minutes to set up. It slots into a spare HDMI port, along with a micro-USB cable that goes into the TV or PC monitor to supply power. There's also a full-sized USB port, which allows you to connect a Bluetooth or Wi-Fi receiver for pairing a keyboard and mouse - or a wired peripheral. Our demo was given on a Venue 8 Android tablet, which had the Dell Cast companion app pre-installed (it's available as a free download from the Google Play Store). You're presented with two modes after launching it: Productivity and Mirror. Productivity mode maximises the Android user interface to fill the entire display, but instead of mirroring the screen, you get a Windows-like desktop mode complete with a taskbar along the bottom edge that shows which Android apps you have open. It's in this mode that you can interact with screen contents with a cursor using a keyboard and mouse, clicking at icons and menu options as you would on a desktop. Operation is fluid, with apps opening and minimising in a second, web pages opening quickly and 1080p YouTube videos play without any stutter. A nice touch is the way that you still get Android-like features - from the Notification bar that can be dragged down from the top of the display to the way the lock screen comes on when you've been idle for a certain amount of time. Mirror mode offers a more classic screen-mirroring experience, blowing up the tablet screen's contents onto the larger display. Apps are once again maximised, but they're controlled by physically interacting with the tablet in your hand rather than using the keyboard and mouse. Whereas Productivity mode is more geared toward the individual, Mirror mode would be more useful for giving presentations or collaborating with others by passing the device around. Mirror mode is equally as smooth as Productivity mode and produced hardly any stutter as we opened and closed Gmail, YouTube and other apps. Unfortunately during our brief demo we didn't get chance to put it through its paces with anything more demanding, and it will be interested to find how it copes during more intensive use cases - such as editing large spreadsheets or multimedia in the cloud. The Dell Cast is certainly a more headache-free way of getting your tablet's contents onto a big screen than snaking cables under carpets and buying adapters, and Productivity mode goes a long way to reproducing the classic Windows desktop experience on Android. As such, it's a boon for anybody looking to work within cloud-based apps using a keyboard and mouse but wants to avoid using Windows 8.1. On the down side, the fact that you need a (supported) Dell device limits the appeal somewhat, although our Dell representative said that extending the Dell Cast's compatibility to other Android tablets in the future is a possibility. It's also assumed that you'll have a spare Wi-Fi (or Bluetooth) receiver lying around, in addition to a keyboard and mouse. There's limited appeal for regular users, who could pick up a Chromecast, which comes with mirroring functionality (but lacks keyboard and mouse support), for less than half the cost.